Type: Double Action or Double Action Only manually selective semiautomatic handgun Chamber: 9x19mm-Parabellum Weight unloaded: 870 g Barrel length: 120 mm Capacity: 15 rounds The Browning BDM pistol is an interesting development, that first appeared in 1991 and was in production until late 1990s). While most of pistols that carry the John Browning name usually were originated from Belgium (models 1910, 1922, "Baby", "High Power", etc), some pistols were made in other countries. Not to mention Colt pistols, designed by Browning, the Browning Arms company of USA imported german-made SIG-Sauer P220 pistols under the name of Browning DA in 1970s. Then came the Browning Buckmark pistol, made in USA. And, finally - the Browning BDM. This gun was designed and produced in the USA by FN manufacturing Inc., an US subsidiary of the Belgian company FN Herstal, who also owned the Browning trade mark, and Browning name is linked to the Belgium (as well as to the USA) for ever, so the BDM is assigned to both countries, with the USA first. BDM stands for the Browning Double Mode (or Dual Mode), and it's mean that the pistol can be had in either traditional Double Action mode or in Double Action Only Mode ... in the same gun, and the change of mode can take a split a second, not more. It is done via the small slotted switch in the left side of the slide. The switch has two positions, marked "P" and "R". P stands for Pistol, or DA mode, R stands for revolver, or DAO mode. The switch can be turned from one position to another by any sharp-tipped tool such a knife, skrewdriver or even a coin. BDM is equipped with ambidextrous, frame-mounted safety / decocker levers. To engage safety (and decock the hammer in DA mode) one must pull the lever down, and the lever will stay in this position. To disengage safety the lever must be pulled up, so a red dot will show on the frame. 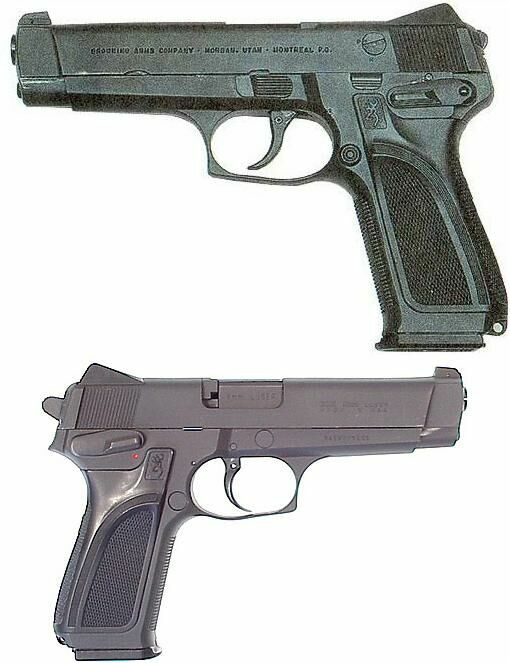 While being quite similar to the Browning BDA pistol, the BDM differs from it in the number of ways. First, being a recoil operated, locked breech pistol with Browning High-Power type (surprise, surprise) tipping barrel, the BDM has SIG-Sauer-like locking system, when barrel engages with single large lug into the ejection port on the slide. Another change from traditional "Browning" style is a disassembly lever on the left side of the frame, that must be turned down for removal of the slide and barrel, instead of the traditional HiPower method where you remove the slide catch lever. The slide stop is also of different pattern, without the usual Browning-ish long lever, and with only small lip protruding from inside the frame. Sights and grip panels are similar to Browning BDA or Browning High Power Mark III. The BDM is one of the thinnest full-size, high capacity combat pistols. It is also reported as reliable and comfortable to carry and shoot, but unusual safety operations require some shooters' adaptation.